Easy-Spin starting for that quick, welcome rrrrrrowrr! Quick Switching Attachments let you change implements in minutes without tools (we invite any time comparisons). Plus a handy parking brake, a deluxe bucket seat, a dash with weather protected closely grouped controls, and a gas gauge in the hood which lets you check the fuel without removing the gas cap. 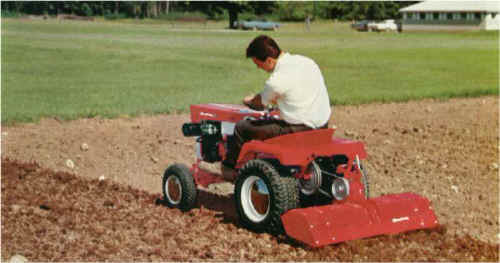 32" Rotary Tiller (No. 990455) (42" width with tine extensions). No crop could resist growing in the kind of seed bed this unit prepares. The gentle, blending action of the strong, non-clogging, self sharpening tines never pulverize soil structure. Hydrolift lever (optional) raises tiller when desired.